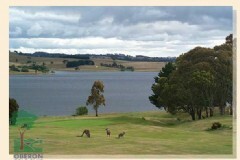 A beautiful 18 hole course on the foreshores of Lake Oberon with all grass greens and pristine, well groomed fairways. With an ACR rating of 68 and an AWCR of 71 this picturesque course offers many challenges, not the least of which is its hilly terrain. Golfers will be delighted by natural attractions such as Lake Oberon, kangaroos and abundant birdlife. The course measures 5582 metres for the white markers and 5209 metres for the red markers. Complete your details below and your enquiry will be emailed directly to Oberon Golf Club. Please check your contact details are correct to ensure the quickest possible reply.